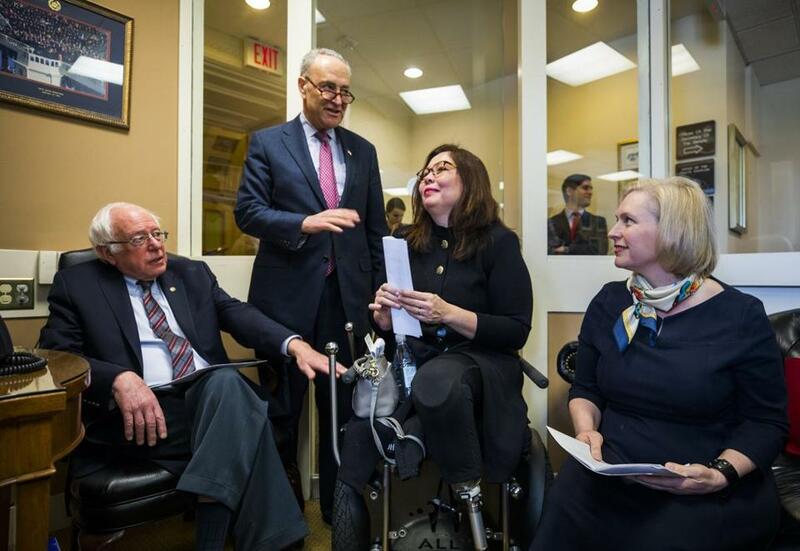 From left: Bernie Sanders, Chuck Schumer, Tammy Duckworth, and Kirsten Gillibrand prepared to speak about family and medical leave in March. IF EVER THERE was a time for careful, sober, data-driven policy analysis, that time is now. The nation has a president whose claims are a word cloud of superlatives, assertions that frequently bear little resemblance to reality. Add a Republican House so eager to advance a right-wing agenda that inconvenient truths and deficit worries are easily brushed aside, and the potential for long-term health care and fiscal harm is very real. Which is why the Congressional Budget Office is now more important than ever. Even in these highly politicized times, the CBO — which has about 235 employees, most of whom are economists or policy wonks with graduate degrees — has maintained its enviable reputation for making a good faith effort at objective, nonpartisan, multifaceted fiscal and economic analyses. “Their unbiased approach is truly invaluable at a time when people are questioning even the most basic numbers,” says Maya MacGuineas, president of the Committee for a Responsible Federal Budget, a nonprofit, bipartisan fiscal watchdog. The party in power in Congress gets to choose the new CBO director when the previous director’s term expires. Republicans chose Keith Hall to run the analytical office in 2015. Among those applauding the Hall pick was then-House Budget Committee chair Tom Price. Rumors of the implosion of Obamacare have been greatly exaggerated. But Price, now secretary of Health and Human Services, changed his tune markedly when the CBO issued an analysis saying that the House’s first health care bill would result in 24 million fewer Americans with coverage by 2026. The CBO’s estimate, Price complained, “is just not believable.” Other administration officials chimed in to similar effect. Still, the CBO’s estimate clearly gave Congress pause. The House’s first effort at the Affordable Care Act repeal died aborning. The House passed its revised bill in early May, before the CBO had time to offer an evaluation, or “score.” But that analysis is due on Wednesday and may well affect the debate in the US Senate, where the House bill now sits. Meanwhile, President Trump’s first full budget will be unveiled on Tuesday. It will likely be premised on unrealistic growth projections. Assuming fanciful rates of growth is a standard trick from the supply-side playbook, one that allows snake-oil budgeters to promise the political equivalent of a free lunch. As we’ve seen in the past, tax cuts sold on the notion that they will pay for themselves by triggering a magic-beans economic bloom have actually resulted in large deficits. Those, in turn, have created pressure for more budget cuts and have markedly increased the national debt. The CBO’s evaluation of the Trump budget will take some weeks. But if past is prologue, its analysis will be far more instructive and accurate than administration claims — and thus well worth the wait.